Green shoots. When I’ve talked to brokers and agents in recent years, I’ve often heard about “green shoots.” That’s gone on for several years now. When I dig deeper, I usually get mixed stories: The recovery is there, but it’s uneven. Sluggish insurance market recoveries are common in the aftermath of financial crises such as the one we experienced in 2007-2008. At first glance, that may not seem surprising: Isn’t all economic activity is sluggish after a crisis? Unfortunately, it is even worse for insurance. In a recent working paper 1 co-authored with Shinichi Kamiya and Jackie Li of Nanyang Technological University in Singapore, we looked at the effect of financial crises on the size of the property-casualty market in relation to economic output. As a first example, consider the U.S. in the 1930’s. 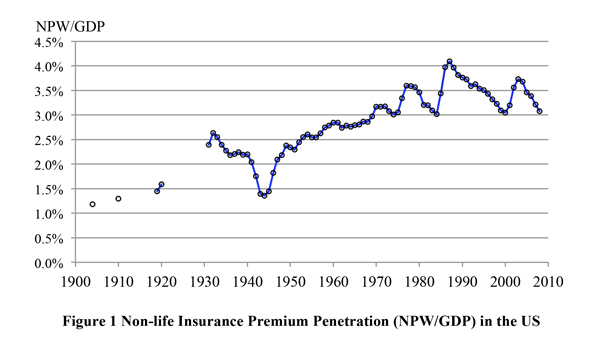 On the eve of the 1933 banking crisis, property-casualty industry premiums stood at more than 2.5% of national output. After the crisis, it took about 20 years for the industry to regain its standing in the economy. This is not an isolated example. Consider the Scandanavian crisis of the early 1990’s. The economy dipped sharply in both Finland and Sweden but recovered its pre-crisis per capita level relatively quickly. Per capita property-casualty premiums on the other hand, experienced a prolonged stagnation and took 15 years or more to recover their pre-crisis levels. The same happened in Southeast Asia after the 1997-98 crisis. While the particulars vary from country to country, insurance market recovery has lagged significantly behind economic recovery in all cases. 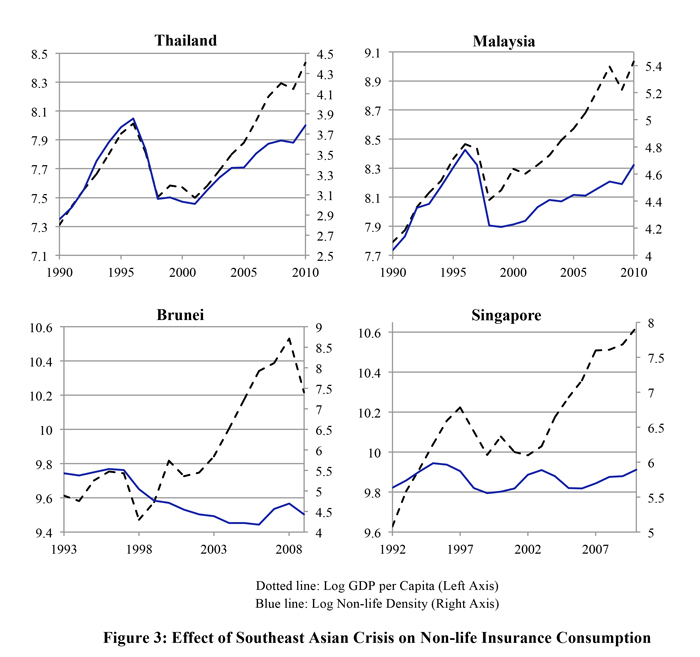 Indeed, 2010 GDP per capita comfortably exceeded its 1996 levels in all four of the countries in Figure 3, but nonlife insurance premiums per capita were still short of the 1996 figures in all cases. 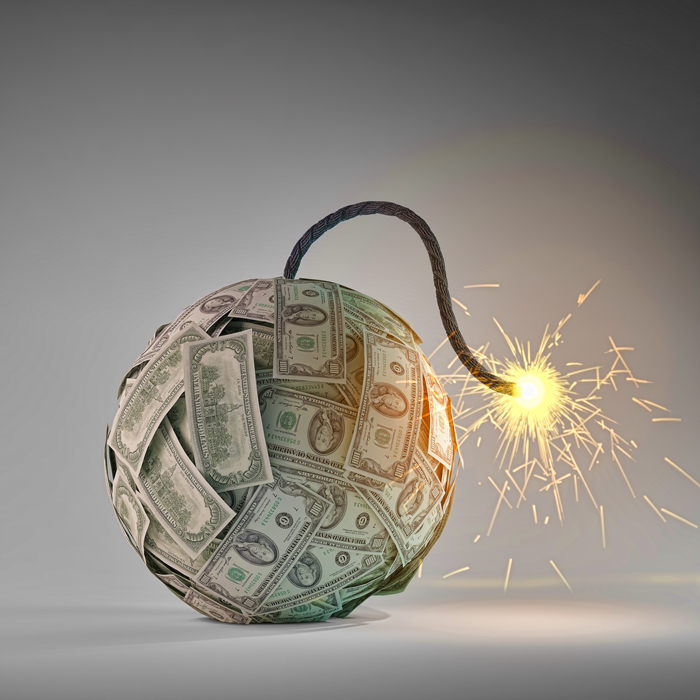 These anecdotes are confirmed in a broader survey of experience with banking crises in our paper, where the effects are shown to linger for 15 years or longer. 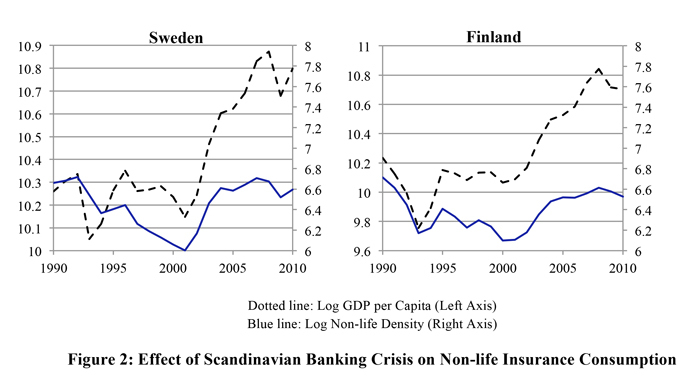 The reasons for the sluggish insurance recovery are not clear, but research on the real effects of financial crises does suggest some possibilities. In particular, some have documented a persistent post-crisis reduction in investment that can last 10 years. 2 Others have noted a shift in the composition of the banking sector balance sheet away from private loans and toward government securities. 3 It is possible that these phenomena both reflect an increased sensitivity to risk in the private sector. If this sensitivity translates into less investment in new and existing private enterprises, this could mean a lower volume of underwriting opportunities for insurers. Whatever the reason, the take-home lesson from history is that the post-crisis hangover in the property-casualty industry could last more than a decade. On the other hand, although the past is often a good guide to the future, it is an imperfect one: Let’s hope that the “green shoots” are a sign that this time is different.